Do you enjoy the various Sine Nomine / +Kevin Crawford games, such as Stars Without Number, Scarlet Heroes and all the rest? Do you like free RPG supplements? 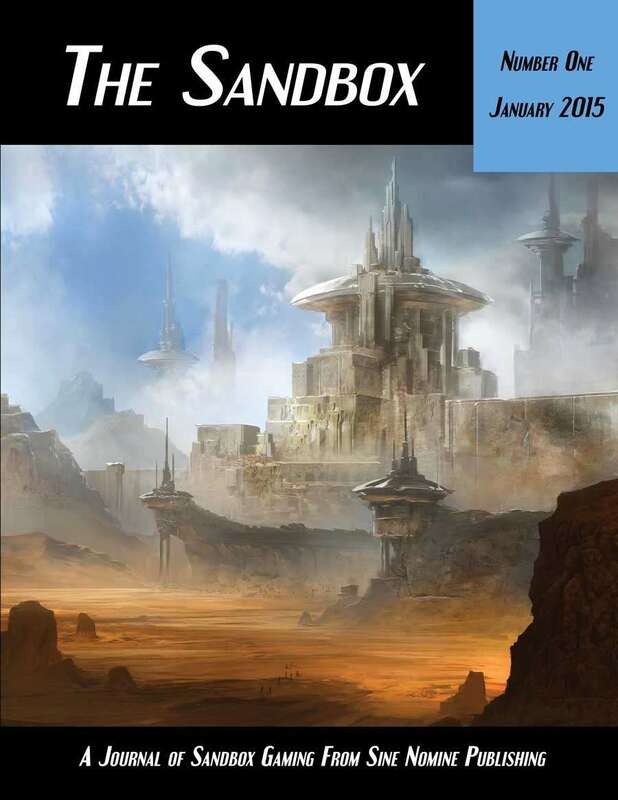 The Sandbox #1 is for you. l table gives the GM the answers they need to provide playable content at the table. 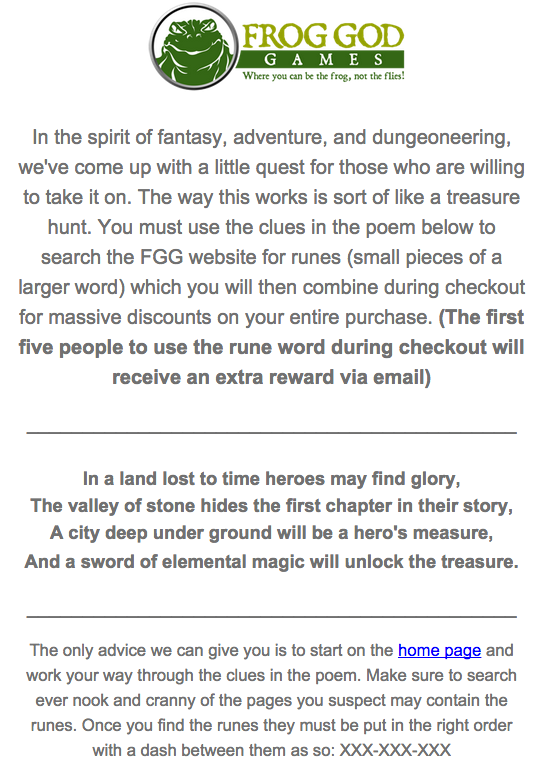 Heck, worth the read for the Kickstarter info alone. I'm a big fan of +Pete Spahn and if somehow you haven't grabbed a copy of the Guidebook to the City of Dolmvay, click the preceding link and do so. 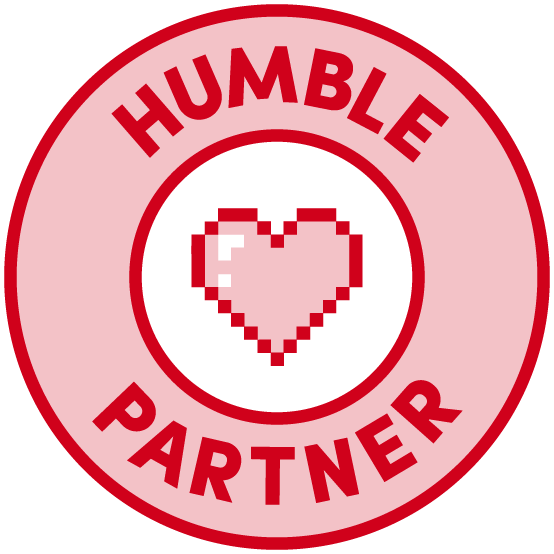 It is "Pay What You Want" and it's a great example of a crowdfunded project giving back to the community. Heck, the Tavern even makes an appearance. This issue also has an article about a demon lord, which is like serendipity, as we just talked about demons on The Brainstorm podcast. Seriously, the episode dropped yesterday. We are introduced to two new elf subraces - the Phase Elf and the Void Elf. The first has it's roots in inter-dimensional space while the second subrace was formerly star-faring. Both make elves something "not of this world" and make for interesting twists and assumptions. +James Spahn (no relation to Pete, James is known for Barrel Rider Games) has an article on the patron saints for the church of law and order.. If you are using Small Niche Games Amerth setting they would drop right in. Next up is an article for mundane and magical items to assist those with dishonest (or thieving) tendencies. I like it. 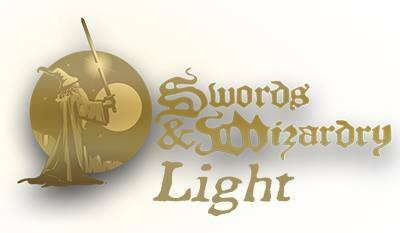 I'm going to steal much of this for my Swords & Wizardry campaign. Werewulfs and Familiars is more of a niche article - well written but only applicable to certain campaigns, but definitely mineable for ideas. Ampulex the Emerald Jeweler is full of ideas and plot hooks. Beetlemirth (cartoons), a review of The Caves of Ortok and an excerpt from Time of the Dying Stars rounds out the issue. At 39 pages, Pete is not fooling around. Well done and packed to the gills. What can I say about Pencil Dice? - Need weighted dice? Shave one side down just a wee bit more. - Need dice AND a stabbing instrument? We've got you covered! - Like to constantly sharpen your pencil? This is the pencil for you. Broken points guaranteed! - You can threaten to break your Pencil Dice if they under perform. Can you make the same claim with regular dice? - These Pencils come with an ERASER! My God man, what will they think of next? - 10 bucks get's you 12 pencils. Why pay bulk prices for pencils when you can overpay for pencils whose points will constantly break when you throw them on the table. - The next Movie / TV Series / Web Series produced by D20 Entertainment will star Pencil Dice. For the right pledge, your pencil die can have a starring role. - Watch where you roll that. You'll poke an eye out! - Pencil. Dice. It's like a Reeses Peanut Butter Cup from some Chthonian alternate universe. Just wait until it gets stuck in the back of your throat. - There a sucker born every minute. You can quote me and write it down with your pencil dice. - At the $16k mark we get RAINBOW PENCILS! Yeah, somehow I find it less than exciting and what a PITA to try and read the pips. I am not "All OSR, All the Time" even if I am heavily weighted towards the OSR. Then again, even some of the more prolific small press OSR publishers aren't "All OSR, All the Time." Variety is good. TROPES: Zombie Edition is a light RPG about the Zombie Apocalypse by +Pete Spahn under his Small Niche Games label (which is fairly well know for publisher OSR / LL compatible adventures and setting material.) So yeah, it's an OSR guy doing a non-OSR game that is made to play quickly and pull out for a change of pace or when some members of the group can't show but y'all still wish to play. It's funding goal is low ($500 and it's already met) and there are about 3 days left in it's funding period. Pete is know for putting out his Kickstarters on time and I expect nothing different this time around. Well, go find another game! This game is about killing zombies, so you can forget all that touchy feely crap! TROPES: Zombie Edition (TZE) is a game of post-apocalyptic zombie survival horror. TZE is about surviving the zombie apocalypse for one more night. It is designed for one-shot play and should be cinematic and action packed! Picture this: You're minding your own business on your way to work or school. You've had your nose buried in Facebook all morning, so you don't really know what's going on in the real world outside of who woke up on the wrong side of the bed, what type of coffee your friends are drinking, and who got the highest score on Candy Crush last night. The light turns green, but traffic is gridlocked and no one is moving. Suddenly, there's a commotion up ahead and a bunch of people start screaming and running towards you. Close behind them, you see a mob of freshly risen zombies shambling in your direction. What do you do? That's the start of a typical zombie Outbreak in TROPES: Zombie Edition (TZE). TZE is the culmination of many years of gameplay and "rules light" game design. The system is easy to learn and fast in play. Task Resolution uses a d6 dice pool which counts successes, making it a breeze to teach newcomers. Veteran gamers will appreciate not having to learn a whole new set of complex rules just for a one-off game. TZE is especially great for when players cancel at the last minute, you've been too busy with "real world" stuff to prepare for your next adventure, or you just need a change of pace from your weekly campaign. 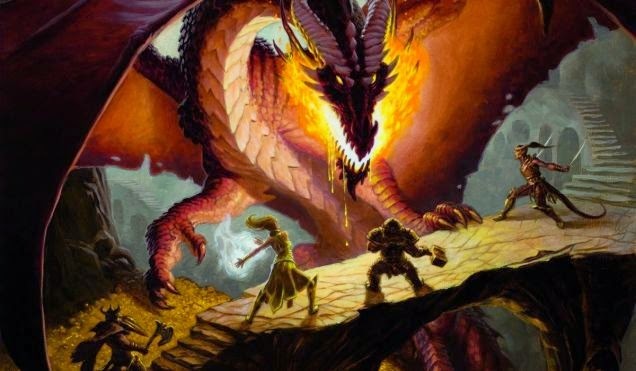 I saw the news yesterday via Twitter and ENWorld, but now even ICv2 has an article about WotC letting go two editors for the Dungeons & Dragon line - Chris Sims and Jennifer Clarke Wilkes. WotC used to do a Christmas purge on a yearly basis, although I think they mostly skipped 2013 and it looked like 2014 was another pass. Guess they were just a month late this time. The ICv2 article goes on to mention there are just 8 members left of the Dungeons & Dragons tabletop team. How large a staff does Paizo have working on Pathfinder? 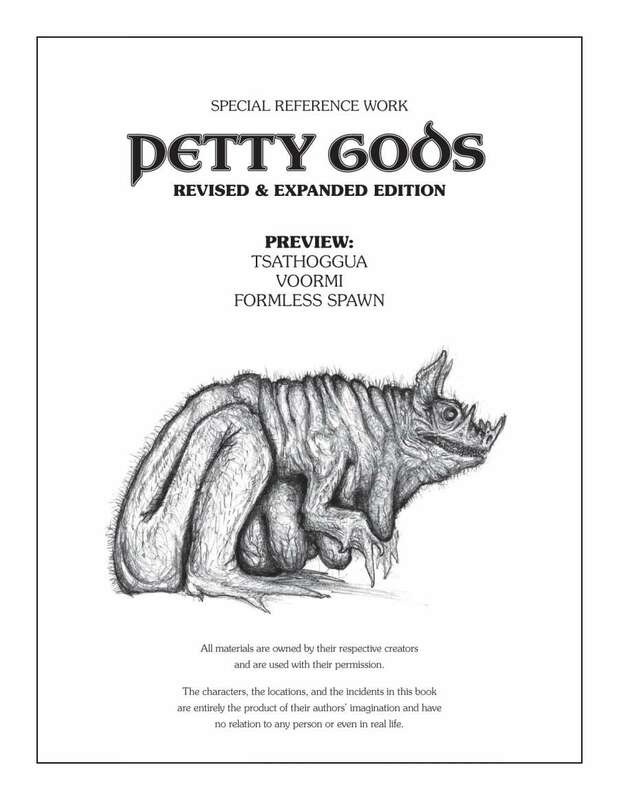 I'm really looking forward to the full Enhanced Petty Gods release. Thanks to +James Mishler for reminding me this was out. Here's the link to the home page. Am I Just Collecting 5e at This Point? I have the 3 D&D 5e Core Books. I have the Starter Set. I have the Basic Rules in an early printed format. I have the Dragonspear Castle and Hoard of the Dragon Queen. I have the new DM Shield, still in shrink wrap, it went immediately on the shelf with the rest. Sadly, I hear mostly good stuff about 5e but have had little time to do more than browse the pages of the books I have. Little free time to spend learning a system that isnt going to be played by my regular group anytime soon. I literally feel I'm just a collector at this point. Is it just me? Are others doing the same? 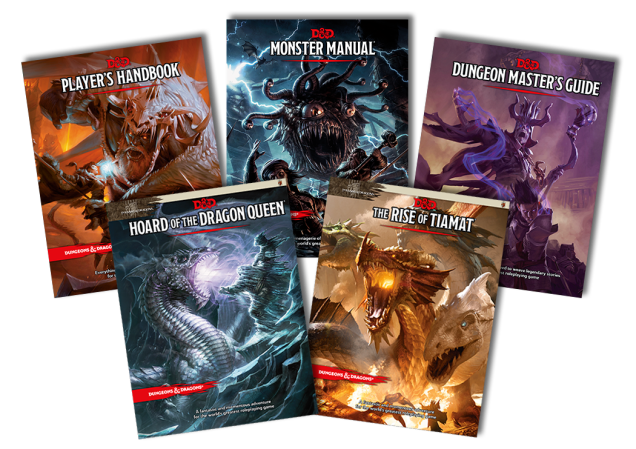 Every once in a while Troll Lord Games runs a sale over at OBS (DriveThruRPG and RPGNow.) This is one of their better sales. 60% off is no joke. Castles & Crusades is what brought me back to gaming and reminds me of AD&D 1e / 2e in many ways. 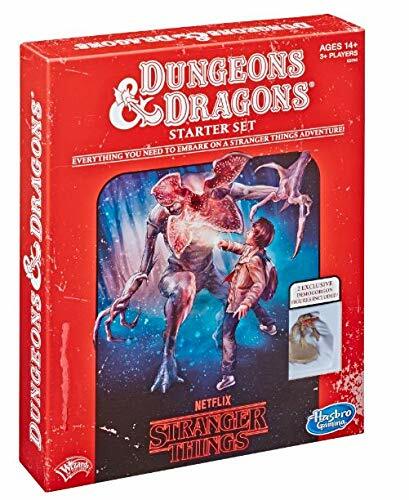 A houseruled AD&D but still D&D to me. I've always wanted to put together some of the Fat Dragon Games print and fold models and terrain. 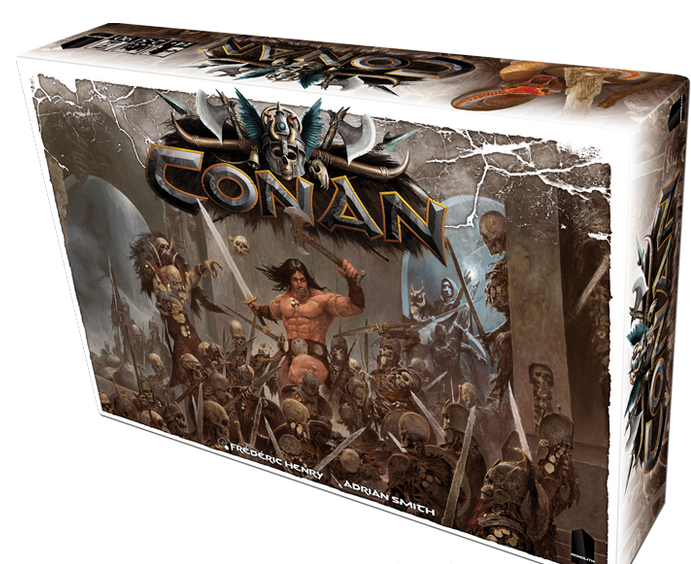 Kickstarter - Conan (Board Game) - Minis and More oh My! Have I mentioned that I'm counting down the days until I can retire, because only then will I find the time to play all the amazing board games I've found via Kickstarter AND paint all of the miniatures I've accumulated. Sigh. Conan is a gorgeous looking game, and I don't say that lightly. It's a GM vs player(s) game, and I expect some light roleplay will sneak in with the right groups. If my count is right, the basic box comes with 74 figures without counting the ones added by the stretch goals met thus far. 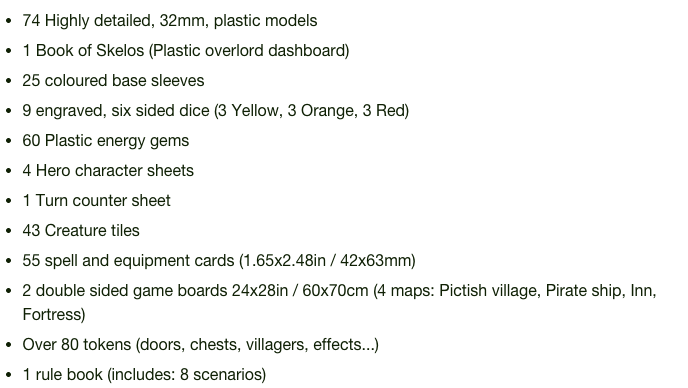 Stretch goals add another 62 figures, plus furniture, skull piles, a poster map, a dice bag, extra dice and an extra double sided game board. Thus far. A goal of $80k is now at over $1,275,000 in pledges. 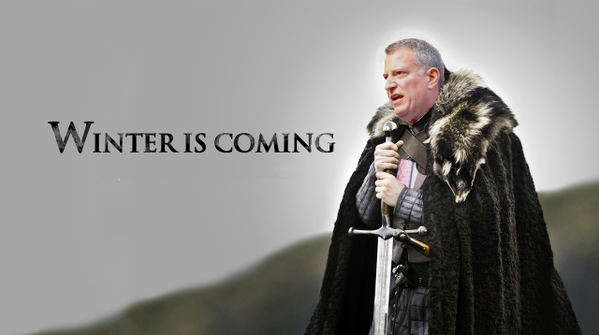 I'm in such a foul winter mood with this "blizzard of the century" that is taking it's damn sweet time to be a blizzard here in NYC. 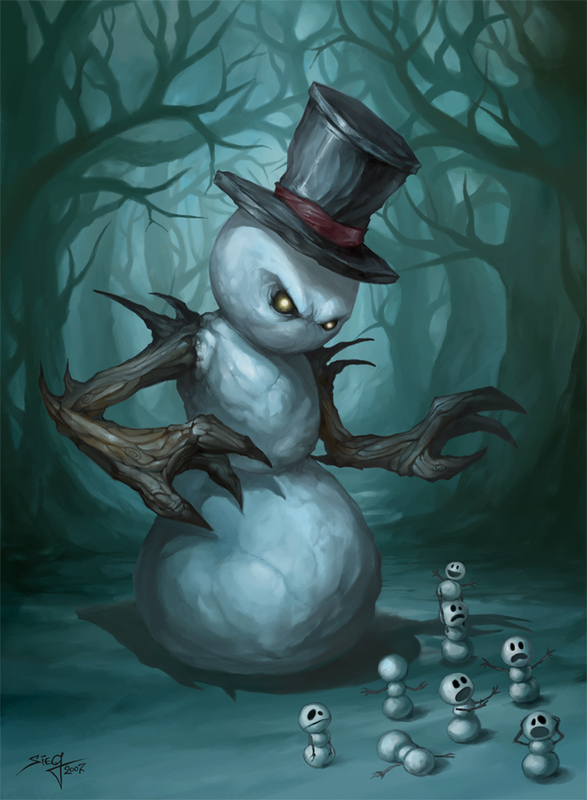 I search the net for evil snowmen. I found the above by Zeeksie over over at DeviantArt. This is my kind of evil snowman. He must have some magical ability to turn folks into mini-mees, which he then toys with before destroying. I could easily stat this out as a Tunnels & Trolls monster. OSR tho? Hmmmm. Getting to work tomorrow should be... interesting. Events like this always make me think of weather events in RPGs. 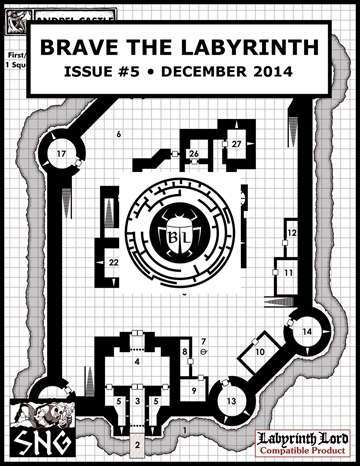 I've TPK'ed a party with a random winter storm from hell in my early days (thanks Dragon Magazine) of gaming. It's got me thinking about some divine weather events that could involve the party, but it shouldn't be directly. Town folks would be in need of protection or some such. If I somehow am not held over at work tomorrow, I will either be stuck at work in all likelihood Tuesday thru Wednesday (assuming I can get to work with the blizzard currently being predicted for NYC) or stuck at home. In either case, I'm preparing reading material. Breachworld - the "not Rifts RPG." Seriously, it's not, even if it does borrow some of the basic tropes. 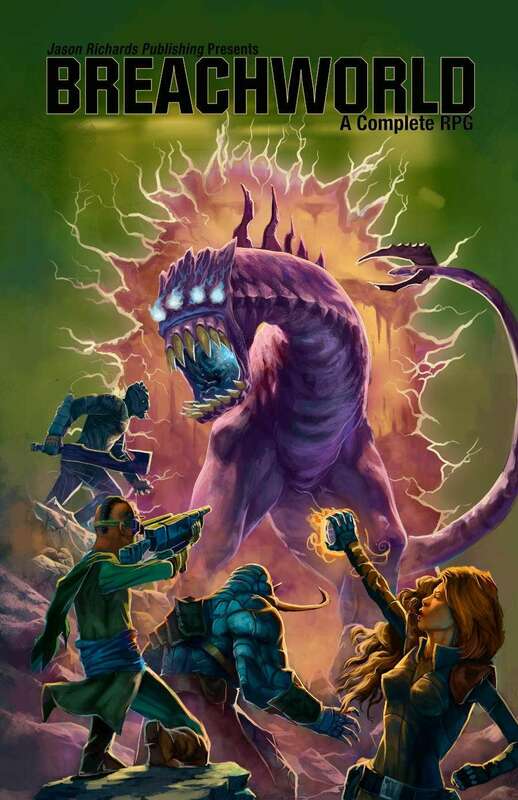 It's built off of the Mini Six system (which in turn is a variation of the Open D6 System which has it's roots in the old WEG's Star Wars D6) we have a chance to see something Rifts-like with a system that work. Heck, I suspect with minimal work one could run a Rifts campaign using these rules and Rifts Sourcebooks - because we know we didn't use the game system as written anyway.) Yes, I've had a love / hate relationship with Rifts for over 20 years. Stoneheart Valley - I'll start by saying I am not impressed by The Wizard's Amulet. It's a railroad with an (DM)NPC as the driving force behind a newly formed party and scenes that tell you the PCs actions. Admittedly, the railroad is a short one and easily fixed, but a railroad none the less. The Crucible of Freya is much less railroady and next on my list to finish reading. The trilogy ends with large - dare I say "Mega?" - Dungeon. Lets see how far I get. 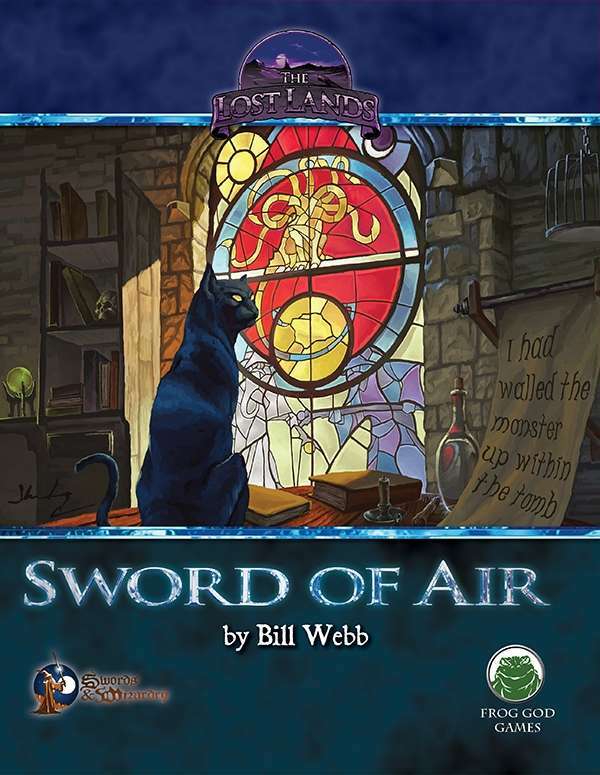 Sword of Air - currently only in PDF, so I'm bringing my tablet. I'll bounce back and forth between this and Stoneheart and see how well it all weaves together on it's own. I'm really enjoying what I've read of this sandbox setting / adventure thus far. I've been using +Scott Ackerman 's amazing blog header over 2 years and it still entertains me to no end. I do, however, feel there should be more. And not more in the way of the old blog headers, which served their purpose but lacked that certain magic that Scott brought to The Tavern. 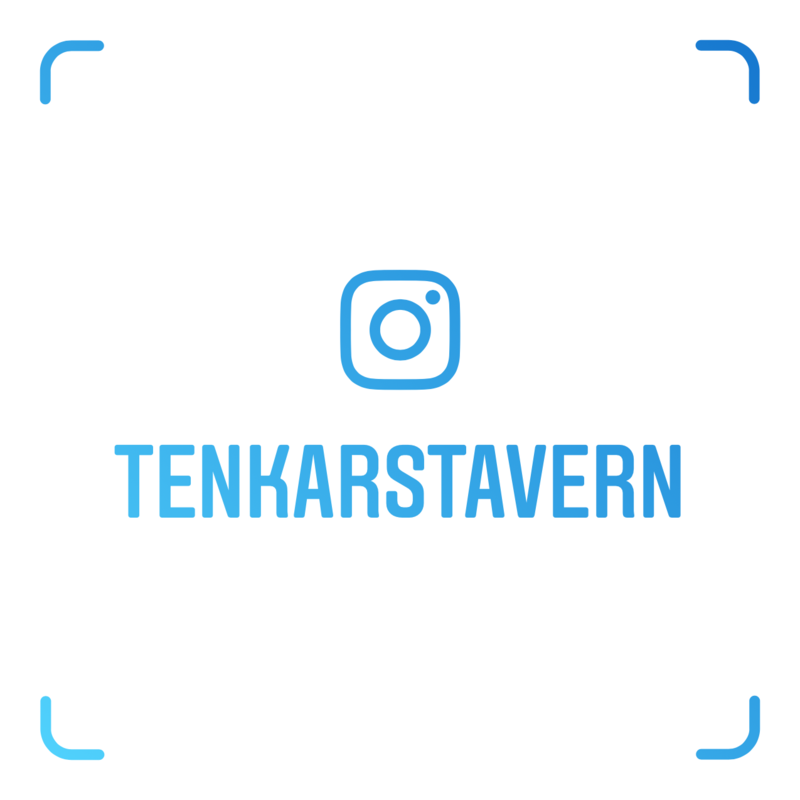 I'd like to have a stable of blog headers, rotating weekly or so and showcasing new and emerging artists in our hobby (or even established ones, if they are so interested ;) I'm really excited to see different takes on The Tavern's header. 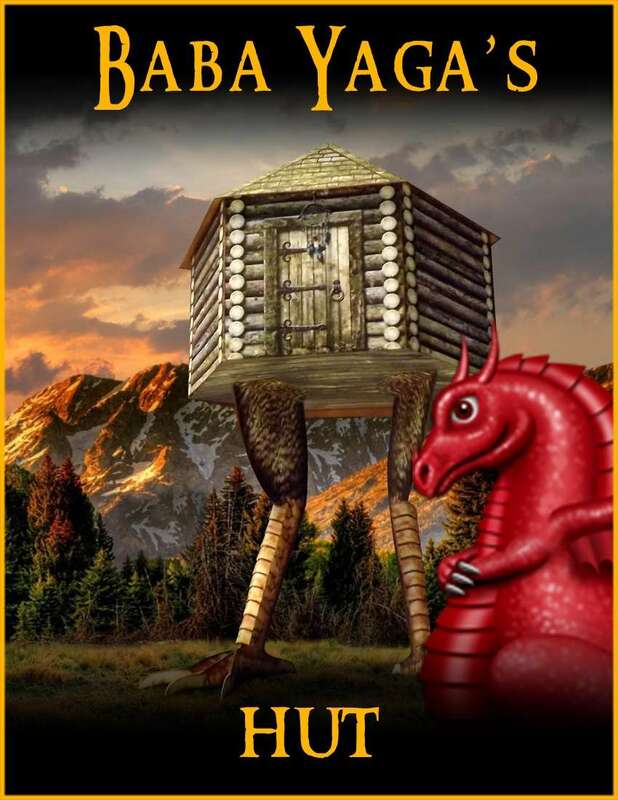 Open call for Headers for Tenkar's Tavern Blog. First time a header is used, a post will announce the new header, showcase the artist's other art and point readers in a direction to find more of their work. There will be a "banner collection" on the right hand side of the blog, showcasing the headers in rotation and linking to the artists' sites. The latest update for Blizzard Juno is 20-30" in NYC with wind gusts of up to 65 MPH at the height of it. The odds of me being stuck at work for an extended period of time time (24-48+ hrs straight) is significant. I'm sure I'll squeeze in time to post, but I'd rather not post something I need to keep tabs on until after this "major snow event." I DO have something I'd like to post, perhaps later today, not a contest but something that certainly would desire entries. It would also be open for a while. 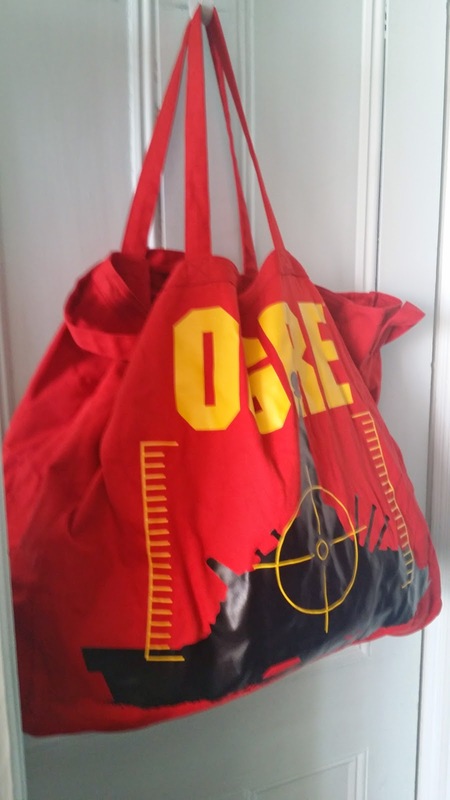 Found a Use for My OGRE Oversized Tote Bag - Winter Storm Juno "Go Bag"
If tomorrow's blizzard predictions hold true, I may be stuck at work tomorrow night (or held over preemptively to stand in for those that can't make it in.) If I do go home tomorrow night, assuming trains are running Tuesday morning I may get held over until Wednesday. Yeah, I expect lots of not much fun over the next few days. And here I was wondering if I'd ever get any use out of the bag. I was surprised to see that For Gold & Glory was no longer hosted on it's old site. The reason for that apparently is that it is no longer a work in progress but a full release (or at least a true beta). It's now hosted on Lulu, where it can be grabbed for free in PDF. No print option as far as I can tell. I've read thru the rules, but has anyone actually taken them for a spin? I'd love to hear about it if you have.